Must be a qualified welder for all positions in metallic, qualified in 6G would be advantage; Experience in manufacture and erection of structural components; Able to work with minimum supervision; Applicants will be required a pre-welding examination prior to employment. Previous housekeeping experience asset; Excellent communication and organizational skills; Strong interpersonal and problem solving abilities; Highly responsible and reliable; Ability to work cohesively with fellow colleagues as part of a team with minimum supervision; Ability to focus attention on guest needs, remaining calm and courteous at all times. Graduate of Bachelor’s Degree in English, Political Science, Philosophy, Management, International Studies, Foreign Service, Legal Management or any related courses; Previous work experience as an Administrative Office, Office Administrator or similar role is a plus; Excellent written and verbal communication skills; Proficient in the use of computer applications and programs such as the Microsoft Office, cloud platforms, etc. ; Can work collaboratively in a team; Able to communicate with foreign counterpart independently and confidently; Willing to put in extra working hours for completing tasks; Able to write correspondence, prepare draft agreements, prepare various reports, and presentations; Can produce positive results based on the desired and targeted time for productivity; The ability to work with accuracy, attention to detail while under, and result-driven; The ability to deal with stressful situations calmly and with diplomacy and tact; Must be proactive, take initiative and well organized; One(1) full time position available. At least College graduate or has experience in legal process outsourcing; Bachelor’s degree in Law or Legal Management is a plus; Excellent English communication skills, both oral and written; Proficient in the use of computer systems and programs; Open to learning something new; Attentive to detail; Remains calm in stressful situations; Conscientious of deadlines and result-driven; Can work collaboratively in a team; Able to work with minimal supervision; One(1) full time position available. Preferably Legal Management graduate or a graduate of BA course; Experience in BPO or Law firm environment is an advantage; Excellent English communication skills, both oral and written; Proficient in the use of computer systems and programs; Provides support to attorneys in a law office in Australia and handle administrative tasks such as filing papers, answering telephone calls, maintaining and organizing reference files; Assists in drafting various legal and compliance documents for the client’s conveyancing and non-conveyancing business; Open to learning something new; Attentive to detail; Remains calm in stressful situations; Conscientious of deadlines and result-driven; Can work collaboratively in a team; Able to work with minimal supervision; One(1) Full time position available. Graduate of 4 – 5 year course, preferably in Major in Financial Management, Business, Banking and Finance and Economics; Diploma of Financial Planning, RG 146 Certification is a plus; At least 1 – 3 years experience in paraplanning, client services role with practical skills in preparing advice documents(SOA); Excellent written and verbal skills with affable client interaction; Highly evolved organizational skills suitable for managing work flow and supervising staff; Operational experience in XPLAN, Coin and Midwinter; Superior knowledge in Microsoft, Excel and Powerpoint; Excellent in Client Management, able to meet deadlines, perform multiple tasks efficiently and can work under pressure; Show confidence yet in a humble manner when dealing with clients, firm financial advisors and wealth managers; Strong financial and analytical skills, diligent attention to details and strong time management skills; Fresh graduates are welcome to apply; One(1) full time position available. Graduate of Bachelor’s Degree in Accountancy or equivalent; CPA or master’s Degree in Accounting / finance or related field is a plus; preferably with 3 – 5 years of supervisory work experience in a BPO industry specialized in financial audit / Financial Reporting / Tax IFRS areas or equivalent; Experience in public accounting / auditing firm (Big 4 firms preferred) will be highly regarded; Knowledge in accounting software MYOB, Quickbooks, and XERO is an advantage; Extensive knowledge on local accounting processes; Knowledge on Australian accounting processes is a huge advantage; Must be PC proficient and preferably experience with large automated accounting system including cloud accounting systems; Keen attention detail and deadline-oriented; Strong problem solving, interpersonal skills and customer service skills are required; Takes responsibility, results-driven, and resourceful and has a strong sense of accountability; Solid verbal and written communication skills with all levels of management; Experience working directly with senior leadership; Ability to communicate complex information in a clear and concise manner; Resilient and mature and is able to deal with ambiguity; Ability to function well in a team-oriented environment and ability to multi-task under pressure; Willing to be trained and can work with minimal supervision; Three(3) full time position available. Graduate of Bachelor’s Degree in English, Political Science, Philosophy, Management, International Studies, Foreign Service, Legal Management or any related courses; knowledge and/or experience in transcription is an advantage; Assists in drafting, editing various legal and compliance documents according to client’s specifications; Perform page-by page quality check to ensure the document is error-free; Excellent written and verbal communication skills; Proficient in the use of computer applications and programs such as the Microsoft Office, cloud platforms, etc. ; Able to grasp immediately and work with approved designed processes and workflow; Can work collaboratively in a team; Able to communicate with foreign counterpart independently and confidently; Willing to put in extra working hours for completing tasks; Able to write correspondence, prepare draft agreements, prepare various reports, and presentations; Can produce positive results based on the desired and targeted time for productivity; The ability to work with accuracy, attention to detail while under, and result-driven; The ability to deal with stressful situations calmly and with diplomacy and tact; Must be proactive, take initiative and well organized; One(1) full time position available. 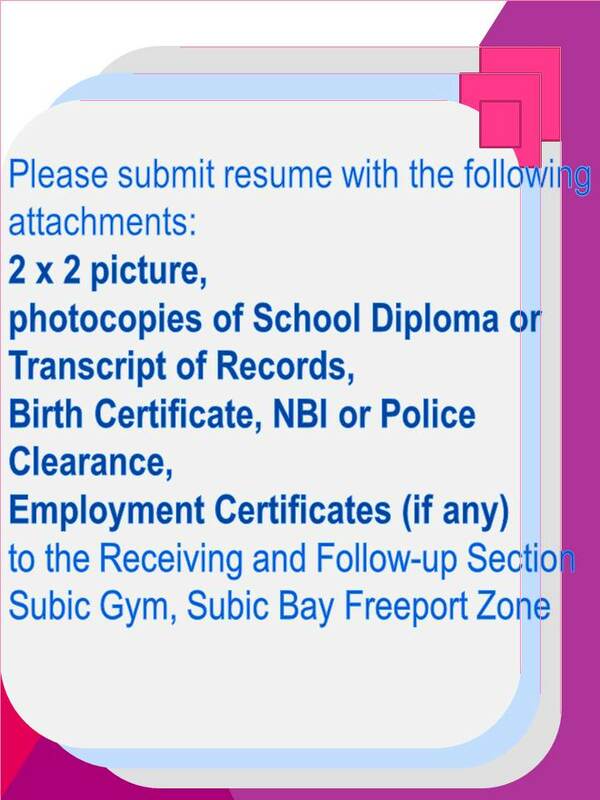 Male; High school graduate; Willing to render overtime; Flexible and can work with minimum supervision. Male; With related experience in Groundkeeping is an advantage; With good moral character and trustworthy.